Marine Harvest's Salmonopoly Loss - Q3 $$$$$s drop 86%! 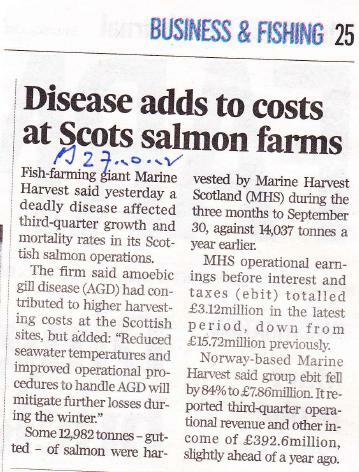 Marine Harvest, the world's #1 salmon farming company, today (26 October) reported shocking Q3 2012 financial results. Marine Harvest's operational EBIT was down from NOK 457 million in Q3 2011 to NOK 73 million in Q3 2012 - that's a drop of NOK 384 million! Marine Harvest's Chief Financial Officer revealed that Marine Harvest's debt was NOK 5 billion!!! If Marine Harvest was playing Monopoly all their properties would be mortgaged to the hilt. Sadly, Marine Harvest are not only draining our oceans leading to net losses in natural resources but they are also robbing Peter to pay John Fredriksen and other shareholders including Morgan Stanley, State Street Bank, Deutsche Bank, Bank of New York, Goldman Sachs and the Statoil Pension Fund. "Fredriksen Salmon Giant Slaughters More And Earns Less," reported today's E24 in Norway as Marine Harvest's share price sunk like a dead seal shot by a salmon farmer. Problems were reported in Norway, Ireland, Scotland and Canada where the parasite Kudoa is killing Marine Harvest's profits (read more via "Marine Harvest Bugged by Flesh-Eating Parasite"). CEO Alf-Helge Aarskog presented the bad news to shareholders and investors in Oslo - with a live webcast around the world. "It's tough to keep sea lice under control in Norway," explained Marine Harvest's CEO. "There's lots of chemical treatments." In fact, "sea lice mitigation" - a euphemism for the use of toxic chemicals to kill sea lice - cost Marine Harvest NOK 41 million with a further NOK 4 million due to mortalities. "Something hits in Scotland," explained Marine Harvest's CEO. "This time it's Amoebic Gill Disease. This amoeba is not active when the temperature is cold. We see it has an effect. We are on top of the situation and learning. There's uncertainty. We are much better prepared for next summer than when it hit this summer." Meanwhile, BBC Radio Scotland reported this morning how Marine Harvest had failed to consult with locals on the Isle of Skye over their plans for a new salmon farm - listen online here (starts at 1 min 42 secs). Back to the Marine Harvest Q3 2012 presentation in Norway this morning. "Canada is challenging," conceded Marine Harvest's CEO as he detailed continued losses due to the parasite kudoa. "We lost 25 million in Chile," explained Marine Harvest's CEO. "We are in a special situation in Chile. We are going to protect our sites whatever it takes. The cost is increasing in Chile. Remember that in this operation we have the best sites compared to other companies but still we are impacted." "This gill amoeba which is impacting our Scottish farms is also affecting out Irish operations," admitted Marine Harvest's CEO. "We are on the right track," concluded Marine Harvest's CEO handing over to new Chief Financial Officer Ivan Vindheim. "I don't think we will have any easy quarters." "The bottom line is more or less zero," explained Marine Harvest's CFO as he explained away losses of NOK 99 million. "This gives us a debt of NOK 5 billion." In closing, Marine Harvest's CEO admitted that Q4 2012 would also be "tough" and that the situation is "challenging". "Going forward we will see feed costs going up," continued Marine Harvest's CEO. "We have concerns over gill amoeba in Scotland and costs will go up there." Marine Harvest's high stakes game of 'Salmonopoly' is draining not only our global ocean but also the coffers of their owner John Fredriksen, the world's 72nd richest person. Reuters reported earlier this month (9 October) that Marine Harvest's core earnings fell a staggering 86%! Marine Harvest is owned by Norway's richest man, John Fredriksen, who is worth over $11 billion and ranked 75th on the Forbes "World Billionaires" List. Norway's "Viking Raider" is nicknamed the 'Big Wolf' ('Storeulv' in Norwegian) on account of his huge appetite for money. In the 1980s Mr. Fredriksen did some jail time on suspicion of insurance fraud - with the case resolved after Mr. Fredriksen paid a fine of NOK 2 million and a $800,000 pay-out to the insurance company (read more online via Wikipedia). "A murky character notorious for rowdy drinking binges and playing rough with takeover targets," reported Forbes in 2001. "After being jailed briefly in 1987 in his native Norway on since-dismissed charges that his tankers burned some of their crude cargo as fuel, he decamped to the tax haven of Cyprus, where he runs a growing empire of tankers, drilling rigs, natural gas ships and oilfields valued at more than $1 billion." A decade later, Mr. Fredriksen is worth over $11 billion but the money-making machine comes at a high price. 'Salmonopoly' was a 2010 documentary by Wilfried Huissman and Arno Schumann exposing the environmental and social costs paid by the activities of Mr. Fredriksen's Marine Harvest, especially in Chile. An English version of Salmonopoly was broadcast in Ireland by RTE in 2011. Mr. Fredriksen is also a passionate fisherman and in 2007 called for salmon farms to be moved away from wild salmon migration routes during a fishing trip to the Alta River (read Altaposten). "He Can Be The Saviour of Wild Salmon," reported Norway's Nettavisen in 2007 with a photo of Fredriksen fishing. A letter from 33 fishing and environmental groups was also sent to Marine Harvest asking the company to "to follow Mr. Fredriksen’s wise advice which would put a stop to salmon aquaculture impacts that kill wild salmon, sea trout and steelhead." Sadly, Marine Harvest ignored the call to protect wild salmon. In 2009, Alexandra Morton, Chief Bob Chamberlin and representatives of the Wilderness Tourism Association of British Columbia once again called on Marine Harvest to move salmon out of the path of wild salmon at Marine Harvest's AGM in Oslo. For more detail on the global opposition to Marine Harvest watch "Farmed Salmon Exposed"
Marine Harvest, meanwhile, have ignored such concerns and have continued to expand into wild salmon migration routes. Marine Harvest is wanting to expand on the West coast of Ireland with applications for super-sized salmon farms in Bantry Bay and Galway Bay. Marine Harvest is branding the proposed expansion in Bantry Bay as "organic". Marine Harvest has attracted global criticism concerning their salmon farming operations in Canada, Chile, Ireland, Scotland and at home in Norway.